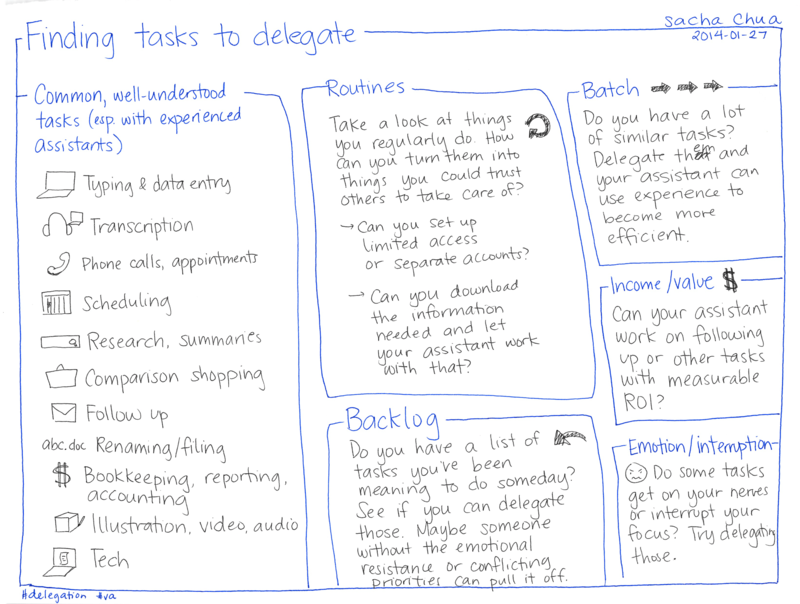 Committing to delegating 2,000+ hours turned out to be the key to blasting through those conflicting thoughts about delegation. I don’t have to think about whether or not I’m going to delegate. I have a box of 30-40 hours a week for a little over a year, and I want to fill it with as many good tasks as possible. It’s actually pretty easy to find things to delegate when I’m not arguing with myself about whether delegation is worth it. I’ve set up a backlog of tasks for people to work on while I document other processes. It’s easier to figure out what I need to do if I imagine what awesomeness looks like. What would it be like if I were fluent at delegation? I’d have a process library with detailed instructions. That would be useful for assistants, but also for me (process improvement) and for sharing with other people who are curious about delegation. I’d also feel confident about choosing people and helping them grow, and I would have a consistent stream of work so that my assistants don’t have to worry about my sudden disappearance. We would track the status of these tasks so that important things don’t fall through the cracks. I’d be good at sharing my vision so that they could see the bigger picture. I would be confident about the return on investment, and I’d have a safety net for mistakes. More specifically, what would this 2,000+ hour experiment look like if it succeeded? What would encourage me to continue delegating beyond the parameters I’ve set for it, beyond the budget I’ve carved out? Self-funding is the obvious answer: if I use this assistance to create resources that I wouldn’t otherwise have, and people value these resources and vote with their wallets, then it’s easy to keep creating. Even if I don’t have that sorted out, though, it might still be worth the additional reach. People often say that it’s better to spend on experiences than stuff. I wonder… It might be worth spending on scale, on other people’s capabilities. Like the way I have more stuff than I need, I haven’t even wrung out all that I can from the experiences that I’ve had. Scale sounds like a completely different category, one worth investing in. What could get in the way of getting there? Trust is a big deal. It’s probably the biggest limiting factor for the things I can delegate. If I can get better at choosing people, trusting them, and keeping that safety net for myself, then I’ll learn more from this experiment with delegation. 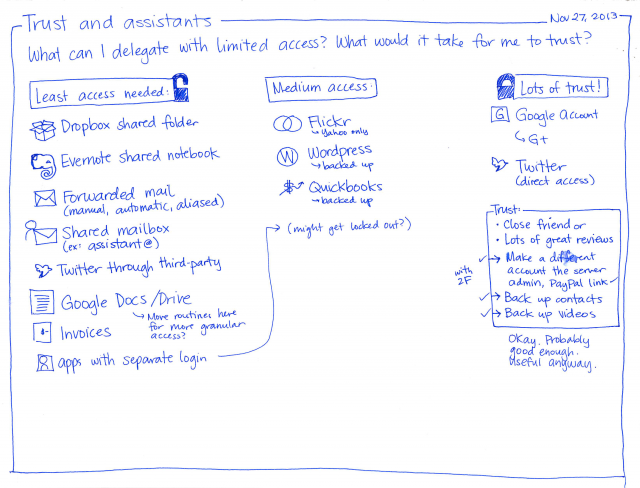 One of the things that I can do to make it easier is to separate my accounts so that I can see which tasks can be delegated at lower levels of trust. For example, I can share a Dropbox or Google Drive folder without granting access to the rest of my data, while other accounts (like Google) are intertwined with more of my digital life. I can also think about a sequence of tasks that allows me to build up trust in someone. For example, I’d previously written about mapping a strategy for outsourcing my podcasting process. If I set up the right sequence of tasks, I can give people more and more work to do, and eventually remove myself from most of the process. While thinking about how I can organize tasks to help my assistants grow, I realized that I actually get a whole lot more out of delegation than the usual benefits listed in books and blogs. This is good. It means that I can transform the dollars, time, and attention I invest in delegation into things I can’t buy. Delegation is an excellent excuse to build and test a process library. I like the way that other people can take care of back-and-forth discussions as well as provide me with ways to work around resistance or things I don’t enjoy. 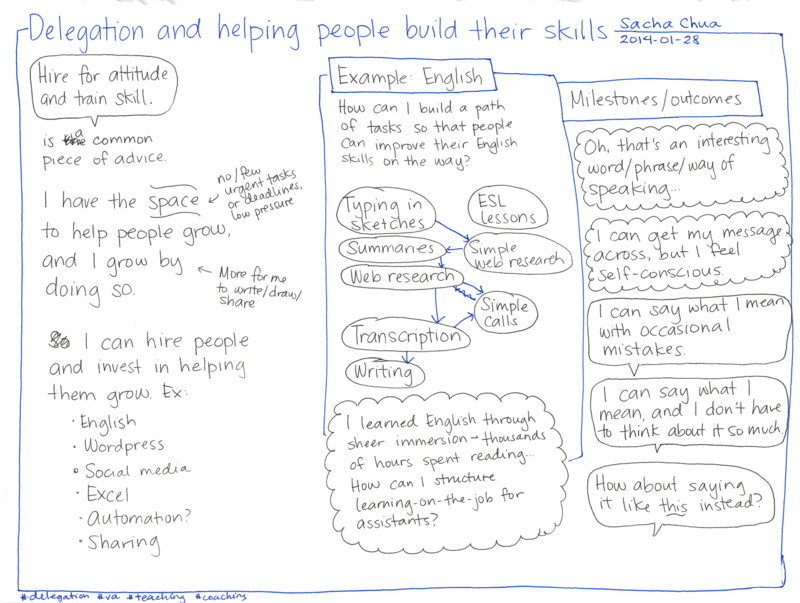 (Doing something repetitive can be boring, but writing good instructions is fun like the way automation is fun… =) ) I can take advantage of other people’s skills, experiences, and perspectives, and their questions can help me clarify what I want. I get the satisfaction of helping people grow, and I grow as well through these uncommon experiments. Describing my processes and lessons learned is also a great way to meet people who are interested in delegation. 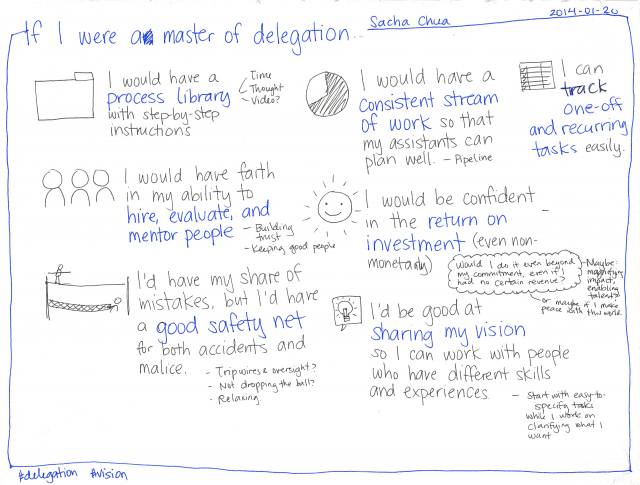 The time leverage that’s supposed to be the main benefit of delegation is actually just a small part of the picture. 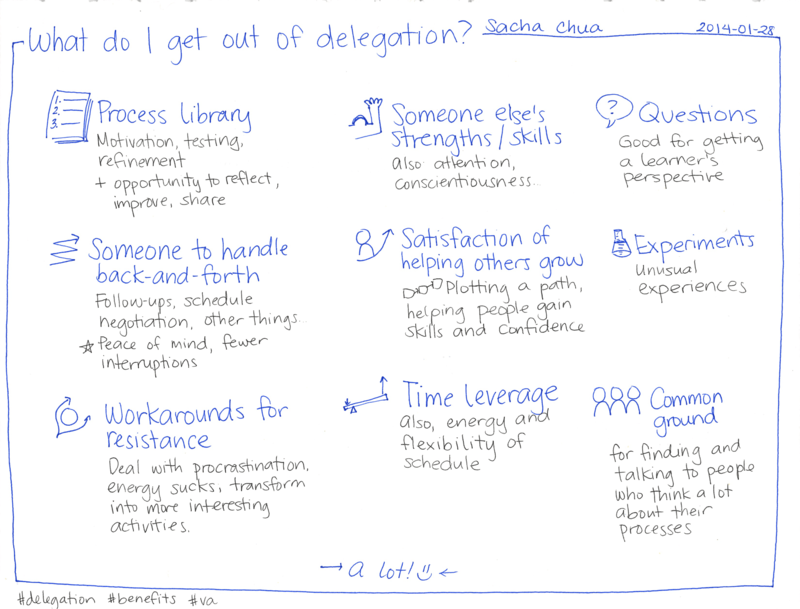 I think delegation will be worth the time I spend in ramping things up. I’m looking forward to building a massive process library that other people can learn from and use to build their own. I’ve met a few people who have process libraries of their own, but I haven’t come across any that are publicly shared. (Maybe people think of them as competitive advantages?) I think I’ll gain even more from the conversations than from holding these processes close, and I’ll eventually figure out how to make the processes even easier to search and access. Who wants to pick my brain about delegation? Who wants to share their insights? Let’s figure this out together. E-mail me at [email protected] and we’ll set up a chat, or leave a comment with your thoughts!